At Tri-County Animal Hospital, we strive to take the very best care of each and every patient. We understand that whether routine or emergency, leaving your pet for surgery can be stressful and unnerving for both you and your companion. That’s why you can count on us to provide quality, compassionate care throughout your pet’s entire procedure. Before surgery, your pet will be screened and anesthetics will be hand-selected based on factors such as your pet’s breed, age, and health. To determine if your dog or cat is a good candidate of anesthesia, we will conduct a series of blood tests before administering anesthesia to confirm that your pet’s liver, heart, and kidneys are functioning properly. After the bloodwork is analyzed your pet will be given an injection of a sedative to make them more comfortable and relaxed. At this time an intravenous catheter will be placed in their arm or leg. This will allow us to administer medication in the event of an emergency as well as provide intravenous fluids during the procedure. Intravenous fluids enhance the safety of anesthesia by helping to regulate blood pressure and body temperature. 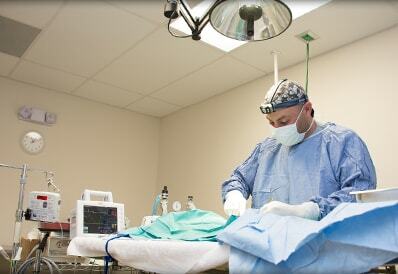 Our main priority is ensuring that your pet is as safe and comfortable as possible during the surgery. A trained technician will monitor your pet during the entire surgery. This technician will track your pet’s blood pressure, heart rate, rhythm, body temperature and blood oxygen levels, and other vital signs and ensure their safety during the entire process. We feel that it’s important to keep a line of communication open during the day of surgery. Our staff will make sure that we have the most up-to-date contact information when you drop off your pet, and will keep you informed about your their condition and progress. Upon the time of discharge, we will explain everything you need to know to care for your pet once they go home. If necessary, a pain management plan may include pain medication to be administered at home to keep them as comfortable as possible at home.